I very much enjoyed this; I'm a barrister working within the English legal system and my practice involves family cases so it was fascinating to see it portrayed on screen, the majority of legal dramas focussing as they do on crime. Was the plot, as some reviews allege, melodramatic and unrealistic? For a start, I think you have to make allowances for the fact that this is a drama, and that if everyone acted calmly, rationally and with foresight throughout it wouldn't be very dramatic. Was Adam's crush on Fiona (Mrs Justice Maye) plausible? Absolutely so: he is shown as someone who has been brought up to follow authority figures - his father, his church elders, and God - and when, in his eyes, they fail him, is it surprising that he fixates on a new authority figure who has, unlike all the others, taken an interest in what he wants? In simple terms, he's on a rebound from God, and latches on to someone who has demonstrated her real life-and-death power over him and at the same time shares his love of music and literature. Was Fiona's response to Adam plausible? This is stretching it a bit more, but the pressures of her lifestyle are entirely realistic, and it is very human to be moved by someone who is plainly interested in you emotionally and intellectually. She is tempted by Adam, but part of the story is how she faces and addresses that temptation. As for the film as a depiction of the English legal system, it was astonishingly accurate. That isn't surprising, as I understand that former Court of Appeal judge Sir Alan Ward was closely involved as adviser. Although the courtroom and judge's corridor were sets, there was extensive location filming and it was a delight for me to see the Royal Courts of Justice, the Inns of Court and even Newcastle upon Tyne combined court centre (where I'd been in a case only a few weeks before seeing the film) shown on screen. Technically, the film got it right too: when Maye is called in the middle of an emotional confrontation with her husband to be told of the urgent application by Adam's hospital, the legal directions she gives off the top of her head are exactly what I would expect. The scene a little later where we see vignettes of several other cases also shows typical bits of family law (injunction against removal of children from the jurisdiction, the hiding of matrimonial assets in companies as per Prest v Petrodel, and Family Law Act 1996 occupation orders and the issue of what justifies an ex parte hearing). The case at the opening is a barely-disguised version of Re A (conjoined twins), studied by every student of English law as one of the leading authorities on the issue of necessity as justification for killing. But perhaps most interesting was the depiction of the working relationship between Mrs Justice Maye and her clerk Nigel Pauling. I know a number of judges who have thought the film captured the judge/clerk relationship very well, and I felt Jason Watkins gave an excellent performance as a mild-mannered but efficient factotum who has to manage his own doubts about Maye's behaviour. 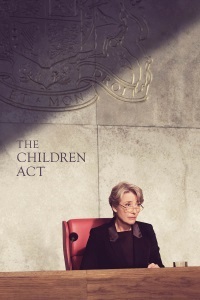 I do hope that The Children Act and its cast are properly recognised when awards season comes round. It's certainly going to be up there as one of the better legal films. Thank you for the insight! I thought this was a lovely and heartbreaking film, love Emma Thompson and Stanley Tucci so much. Stanley Tucci wasn't who I pictured when I read the book, (though he was fine) but Emma Thompson matched my expectations a bit. I thought the film was a good adaptation and enjoyed the hell out of Thompson's performance. In the film, as in the book, I was left cold by the character of Jack. At first he's sympathetic as someone vying for his wife's attention, but when he came back and was all baffled when she changed the locks and wanted him out...I mean come on, man! Don't be all cool and rational, "I only stepped away for two days but you stepped out ages ago blah blah blah." I didn't have as much sympathy for him as I think I was supposed to. Interestingly, I found the Fiona in the book a bit less sympathetic but enormously so as played by Emma Thompson. And I loved Jason Watkins as her clerk. The last thing I saw him in was W1A and my, what a different character! I watched the film with the nagging feeling I'd seen him in something recently, and on getting home checked IMDB and realised that he'd played the ill-fated and annoying (but ultimately right) forensics examiner Ifield in Line of Duty Season 4.